The last half century has seen both attempts to demythologize the idea of God into purely secular forces and the resurgence of the language of "God" as indispensable to otherwise secular philosophers for describing experience. 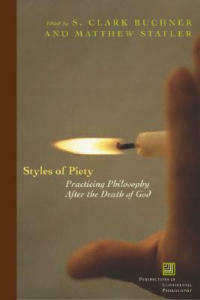 This volume asks whether "piety" might be a sort of irreducible human problematic: functioning both inside and outside religion. S. Clark Buckner works in San Francisco as an artist, critic, and curator. He is the gallery director at Mission 17 and publishes regularly in Artweek and the San Francisco Bay Guardian. He has a Ph.D. in philosophy from Vanderbilt University. Matthew Statler is the Director of Research at the Imagination Lab Foundation in Lausanne, Switzerland. His current research is focused on practical wisdom as it pertains to organizational phenomena such as strategy making and leadership. He also has a Ph.D. in philosophy from Vanderbilt University.